During Storytime, we started reading Way Too Much Challah Dough. We discussed some of the people who help make a book: the author, illustrator and publisher, and what jobs they do. One student has this book and researched the author’s name, then we said who the illustrator and publisher are. This book and the one we read last time are published by the same company. 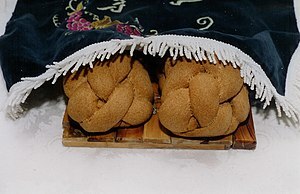 The books are connected because they both discuss preparing for Shabbos. In this book, Mindy is helped by her Bubby, which is the Yiddish word meaning grandmother. Students learned what a synonym is, and came up with Hebrew and English synonyms for Bubby. We discussed becoming distracted when we are doing something, and whether Mindy made a good decision by adding more yeast. We will see next time what happens because of the decision she made when she was distracted. Moshe and Yael shared a computer during a playdate. They used their playdate time to attend Siddur Class together at Room 613! Morah Elana liked that idea. We discussed the bracha al netilas yadayim. Baruch means that Hashem gives us blessings (good things). Ata means that when we say a bracha we are talking to Hashem! So we want to understand exactly what we are saying. Devorah said that she knows prayers only in English. We talked about being allowed to pray in any language we know because Hashem understands all languages. Hashem is so smart – Hashem invented our brains! We wash our hands in the morning to take away tumah because when we were asleep our neshama went a little bit back to Hashem. We wash each hand 3 times – pouring water first on the right hand, then on the left, and so on. We use a negel vasser caup – a washing cup – a natla (the Israeli word). Neggel vaser means nail water in Yiddish. We observed a beautiful negel vasser cup that Morah Elana uploaded. Asher kidishanu means that Hashem made us special by our doing mitzvos. This bracha says that Hashem told us to wash our hands in a special way.